Roman blinds are ideal for smaller windows, where curtains might drown the window, but they’re great for larger windows, too. That’s because Roman blinds offer simple, modern aesthetic, which is practical, too. Installing Roman blinds is pretty straightforward - if you know what you’re doing - and hanging them yourself is a great way to cut costs. As such, we’ve put together this brief guide to fitting Roman blinds. Ember Thermal Roman Blind. Get it here. To ensure your Roman blinds will make a good match for your window, it’s worth doing a little preparatory work before placing your order. What kinds of Roman blinds are there? This entails attaching the blinds to the top of the frame. This method will take up some space on the window itself, but in the case of small windows with semi-transparent blinds, this isn’t such a huge concern. Be aware any potential obstructions, like protruding handles. Here, you’d be attaching your fittings to the walls on either side of the recess. This means it’s necessary to ensure said walls are parallel all the way down so that the blind can move freely. This danger is especially pressing in older properties, which might have become crooked over the years. If you’d like to maximise the amount of natural light entering the room, you might want to hang your blind outside the recess. When they’re open, Roman blinds will take up space at the top of the window, which means the further up they sit, the less light they’ll block from entering the window. You need to know how much distance your blind has to cover, and the only way to do this is by taking a tape measure to the opening. If you’re hanging your blind inside the recess, then you don’t want the bottom to be scraping along the sill. On the other hand, if you’re hanging it outside of the recess, your blinds can be slightly wider. Once you have your blind and rail to hand, you’ll be able to start putting it together and getting it into position. Before we get started, let’s assemble all of the items we’ll need to see the job through to completion. Your first step should be to determine where you’re going to be attaching the blind. This means measuring the length of the rail, and marking in pencil where it’s going to be placed. If you’re installing within the recess, then you’ll need to make sure the window’s handles aren’t going to get in the way of the blinds. Position your brackets so there’s a comfortable gap, then mark up with pencil. If you’re installing your rail outside of the window, then make sure everything is symmetrical. Subtract the length of the window from the length of the headrail, and divide the result by two. This is the distance the rail will need to protrude on either side. Your brackets will need to be even. You can do this with the help of a spirit level. If there’s a difference between them, you may need to compensate with a shim or two – these are small devices built to sit between the bracket and the lintel, to bring it into alignment with the opposite bracket. If your rail is longer than 1.5m, it’ll need to be supported in the centre by a third support. Once you’ve marked and double-checked your points, you can start drilling. Drill pilot holes using a smaller bit. This will get you through the outer plaster and against the underlying lintel. Assuming said lintel is made from steel, you’ll probably need the high-speed bit to get through. You’ll have to be patient here, as solid steel will put up a lot of resistance. Don’t apply too much pressure, or you’ll snap the bit (that’s why you’re wearing goggles). To protect the tip of the drill, you might apply a little bit of oil. If you’re drilling through tiles, then things get a little more complicated. Cover the surface in masking tape before you start drilling; this will prevent slippage. Once you’ve created a series of suitable holes, you can screw your brackets into position. To position your headrail you’ll need to hold it at an angle and hook the top into the brackets. With a little pressure, the entire thing should click into place. Repeat this process on all sides, and your Roman blind should be just about ready to use. You must secure the adjustment cord to the wall. This will help keep children and pets safe. You don’t need to be quite as precise with this fixing; mark the desired point on the wall and screw the hook onto the wall. If you’re not too comfortable with the idea of drilling through a steel lintel, however, it might be worth getting professional help in. Not bought blinds yet? 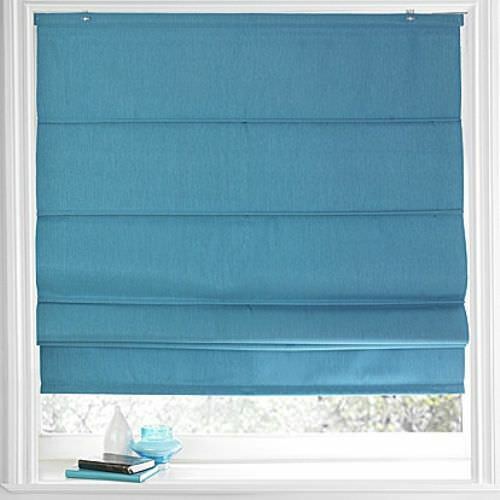 View our Roman blinds here, or our complete range of blinds here.